Check out what me Aunt Jan and Grandma sent us in through the mail: a recipe for shrimp with spicy lime ginger butter (see photo below) and a couple decks of cards accompanied by the sweetest note. 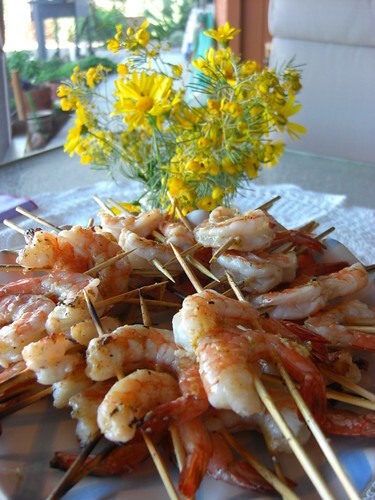 Ever since I tasted the grilled shrimp for my birthday/Easter, I fell in love with it and longed for the recipe...and now it will be part of my collection!! The game cards came in two color schemes, green/blue and red/pink/orange so I don't get the two decks mixed up. That way I can stay sharp at the game of gin for my next match with the iron ladies who originally taught me the game. Not that Grandma and Aunt Jan thought I needed practice but no--I really do. My husband and I have been meaning to buy some cards to play with each other and these could not have come at the right time, not to mention how beautiful they are. Now why can't I think of something so thoughtful for these are a few of the sweetest gifts we've received. Many hugs and kisses, Grandma and Aunt Jan. We love you! !